Occupying the entire northern bay of Lake Traunsee, Gmunden offers everything you expect from a proper Salzkammergut town: Pretty castles, churches and lakefronts with promenades, as well as 19th century villas with wooden porches and balconies. No wonder that Gmunden is popular both with tourists and domestic visitors from Austria. It has been so for a long time: Once the Viennese aristocracy had discovered the Salzkammergut in the 19th century, it was a matter of years until the international jetset followed. A view on Gmunden and Lake Traunsee from a small aircraft. 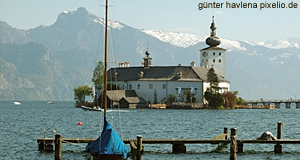 Gmunden and its scenic surroundings were frequently visited by such distinguished guests as Nikolas, the Tsar of Russia, Wilhelm the Kaiser of Germany as well as Franz Schubert, Johannes Brahms and Arnold Schoenberg, the composers of Vienna. At its peak, Gmunden rivalled its main competitor Bad Ischl in terms of celebrities - today, both towns are still similarly popular as day-trip destinations. With a tourist record like that, it is not surprising that the town centre of Gmunden can be rather crowded during the main season in the summer. For the usual sightseeing, try to stay in the central parts, along the promenade and with the castles. The attractions ins particular: The obligatory town hall or Rathaus is - like in many other Austrian towns - one of the major sights. It contains a Glockenspiel made of ceramic bells - supposedly of Meissen porcelain. This is a hint to one of the major industries of Gmunden: The traditional ceramics and porcelain manufacturers that have made pots and pieces by the Traunsee for many years. The glockenspiel plays several different tunes over the course of a day, you can find out which one by reading a list on the town hall′s door. Nearby is another reference to ceramics, the "Klo & so - Sanitärmuseum", a museum dedicated to toilets. Most other buildings that are of interest are concentrated in the medieval part of Gmunden. The Rathausplatz or Town Hall Square is used as a market square and offers impressive vistas over the surrounding mountains. The parish church of Gmunden is famous for its Baroque altar, made by Thomas Schwanthaler in 1678, and depicting an adoration of the magi scene. As mentioned in the respective article, Schwanthaler was a big dude in the Baroque Salzkammergut art business and heavily involved with the construction of an altar in nearby St Wolfgang. The medieval buildings reflect the past of Gmunden: Originally founded in the 5th century, it became a town in 1278. Over the course of the Middle Ages, the entire region grew prosperous and powerful due to the salt trade. Gmunden was heavily fortified and still bears the scars of several wars that were to follow: Reformist revolts, Turkish wars, the 30 Years′ War and the War of Succession each involved Gmunden and its surroundings. Continue with "Gmunden - Part II"